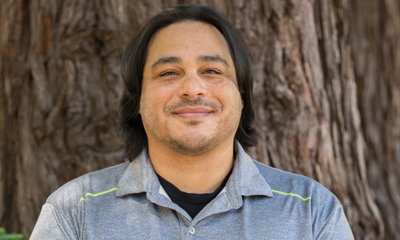 Tony Soto is a community safety officer at UC Santa Cruz. A new scholarship from the UC Santa Cruz Retirees Association aims to make a university degree more affordable for UC Santa Cruz staff and their dependents. The UC Santa Cruz Retirees Association Silver Slug Scholarship will enable its first recipient to graduate early. Tony Soto used the scholarship to pay for summer classes, moving the completion of his degree earlier by two quarters. A community safety officer, Soto (Merrill ‘19, legal studies) can typically be found patrolling campus in the evenings, which he prefers because it gives him the daytime to pursue his studies. He said it was an honor to be the first awardee. “I’m really ecstatic and very grateful,” Soto said. Soto has been in his job for five years. He says the position is mostly routine, though he does assist responders during emergencies. And it can include surprises. Earlier this summer he found a group of students involved in a wiccan ceremony in the woods near Porter College. He had to ask them to stop because of the fire safety issue. “They weren’t happy, but you can’t have a bunch of candles out in the woods at this time of year for safety reasons,” Soto said. As a community safety officer, Soto has enjoyed getting to know students from the time they arrive on campus to their graduation. “It’s nice watching these young adults grow,” he said. Soto is excited to spread the word about the scholarship and tuition discounts available to UC Santa Cruz employees. He said he didn’t think educational benefits are well-known among staff. Members of the Retirees Association were inspired to establish the scholarship by memories of working alongside fellow employees struggling to cover educational costs for themselves or their dependents. Mary Wells, who was on the Retirees Association board that selected Soto, noted that he has worked full time throughout his adult life and that on top of his studies and his work, he dedicates time to raising his children. The 41-year-old called his path to a B.A. a “long winding road.” Prior to attending UC Santa Cruz, he had earned associates degrees in psychology, social sciences, and administration of justice. His next step will be law school or another area of graduate studies. If you would like to support the Silver Slug Award for UC Santa Cruz staff and their dependents by making a tax-deductible charitable contribution please donate online here. Staff and faculty are also able to make a gift to the Silver Slug Award via payroll deduction.